Give Your Lawn a Spring Face Lift! Your lawn is probably not the first thing on your mind during these harsh winter months. I mean why would it be when it’s covered in a blanket of snow right? Wrong. Late winter is actually prime time to start planning your lawn care routine. So that being said, here are a few quick lawn and soil maintenance tips to help revive your lawn for Spring. No seriously, it is. You’d think that if your lawn was a disaster, the grass is to blame. This conclusion makes sense, but in reality, it’s probably your soil quality. There are all sorts of factors that come into play when keeping the perfect lawn monoculture, and it all starts with the soil. 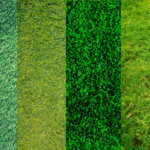 First things first, let’s identify the different layers of your lawn. There’s the topsoil which is the very uppermost layer. 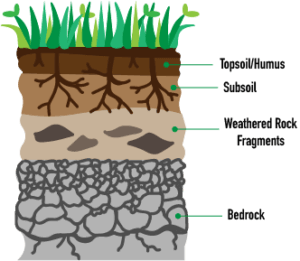 This layer is where a majority of your lawn’s nutrients are found. Organic material such as dead leaves, leftover thatch or compost, animal droppings, dead insects, etc. are absorbed into the soil. This mixture of decayed organic material is also referred to as humus (not to be confused with the delicious chickpea spread you eat). Some regions are naturally equipped with nutrient-rich topsoil, while others are severely lacking. It’s important to know what types of soil occur naturally in your geographic region because that will help determine the amount of new soil and nutrients you’ll need to add. You can find out more about your soil type from soil surveys conducted by the Natural Resource Conservation Service (NRCS). The next layer down is the subsoil. This layer lives right below the topsoil and also houses a good amount of nutrients, although not nearly as much as it’s neighbor above. The subsoil is usually composed of a variety of small minerals including sand, silt, dirt, and clay. The next layer on our decent is weathered rock fragments or clay. This layer is true to its name and is composed of bits and pieces of bedrock that have broken off, thick clay and other assortments of minerals. This part of the soil is not rich in nutrients and if your soil consists of a majority of weathered rock fragments or clay, then you’ve got yourself a problem. The very last layer on our journey to the center of the Earth is bedrock. The bedrock layer is hard, solid rock. It could be of a variety of different rock types such as sandstone, limestone, granite, or a complex mixture of them all. Your lawn is a complex ecosystem of living organisms who all rely on each other to thrive. 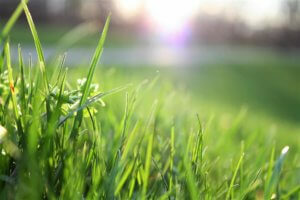 Your grass needs the perfect mixture of sunlight, water, and nutrients from the soil. These nutrients are created through a variety of critters, insects, and microbes that live and feed on your grass. They all rely on each other to survive, and if one part of the ecosystem is unhealthy, it can affect the entire balance. Maintaining your lawn’s ecosystem is also dependent on keeping the soil loose so that it can easily soak up the air and water it needs. It’s common for snowmelt and cold temperatures to cause your lawn to become very compact, making it difficult to get the proper nutrients it needs. One way to combat a compacted lawn is through Aeration. Aeration is the process of introducing air into the material and in the case of your lawn, this means using a manual or plug aerator. This device can be rented or purchased at your local hardware or home and garden shop. A common issue that people run into once the snow thaws, is bare patches in their lawn. If this happens to you, you have two options: plant fresh grass seed in the bare patches or re-seed your entire lawn. You’ll want to make sure you use the same type of grass seed that’s already growing. If you decide to wing it, the new patches of grass may not match your lawn’s color/texture, which will create a patchy appearance. If you don’t know what type of grass is growing in your lawn, you can do the research on your own or hire a professional to identify it for you and offer some advice. Now that you’ve identified your grass type and bought the proper seed, it’s time to get to work. As we had mentioned above, aeration is key, so make sure you aerate your lawn before planting new seed. Once your lawn is aerated, you’ll want to spread a layer of compost or fertilizer that’s at least 1 inch thick over the top of your soil. You can work it in with a rake then spread the seed evenly over the top. After you’ve successfully planted your grass seed, you’ll want to maintain proper watering habits. You’ll water the fresh patches the same way you usually water your lawn. The main thing you want to avoid is high water pressure and large puddles because this can wash your seeds away or drown them. You’ll also want to do your best at keeping your children and pets off the grass seed or else it runs the risk of being trampled and may grow unevenly. 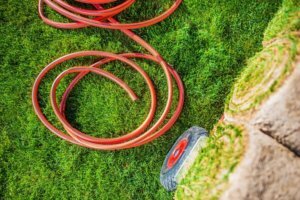 Now that you’ve put the time and sweat into properly prepping your lawn for Spring, you’ll want to make sure that you continuously follow the do’s and don’ts of lawn care all season long. Early Spring – A granular application of fertilizer to green lawn up and a pre-emergent to help prevent grassy weeds like crabgrass and foxtail. Late Spring – A slow-release fertilizer that feeds the lawn throughout the summer months. A booster application of pre-emergent to help control grassy weeds like crabgrass and foxtail. Spot treatment for broadleaf weeds as needed. Insect Control – A granular application that controls insects damaging the top of the turf and grub control. Provides season long control against grub damage. If you follow these simple lawn and soil maintenance tips, you should have fresh, velvety soft grass come, Summer!